As a partner to the health service, the international pharmaceuticals company Roche is discussing the challenges facing healthcare and contributing to a discussion on equality of care. How is a platform to be created which spreads the discussion and moves it into the corridors of power? 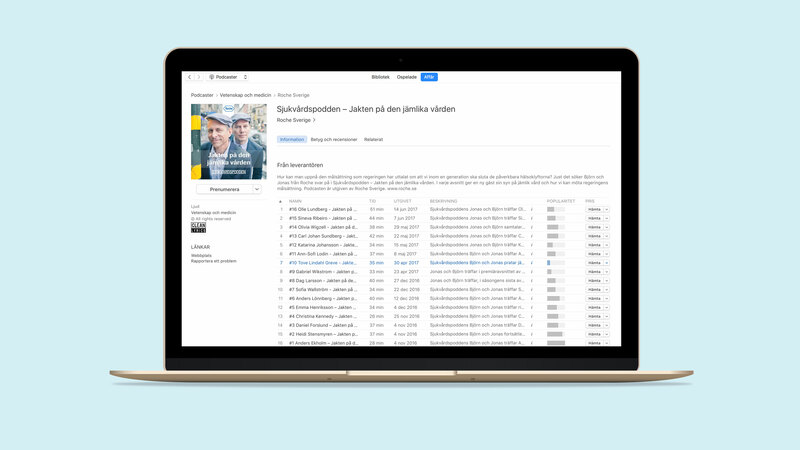 Narva produced a concept with innovation, communication and trust as the fundamental elements, including a podcast with people in positions of power. ”The Healthcare Pod – the hunt for equal care” was launched in autumn 2016. In a series of personal conversations, two policy managers at Roche – Björn Arvidsson and Jonas Edström – discussed challenges and solutions together with eight of Sweden’s most important opinion formers and decision makers within healthcare. A podcast was chosen as it is an easily accessible, manuscript-independent way to meet, with the listeners almost sitting at the table. The strategy was also based on the judgement that priority target groups are used to podcasts as a forum. The Healthcare Pod has demonstrated that Roche wants to take social responsibility through analysing and discussing how care can be made more equal together with leading opinion formers and decision makers who represent different perspectives – policies at different levels, journalism, authorities and idea-based organisations. The Healthcare Pod won a Polaris Award. The Polaris Awards is an international competition which highlights successful PR campaigns. 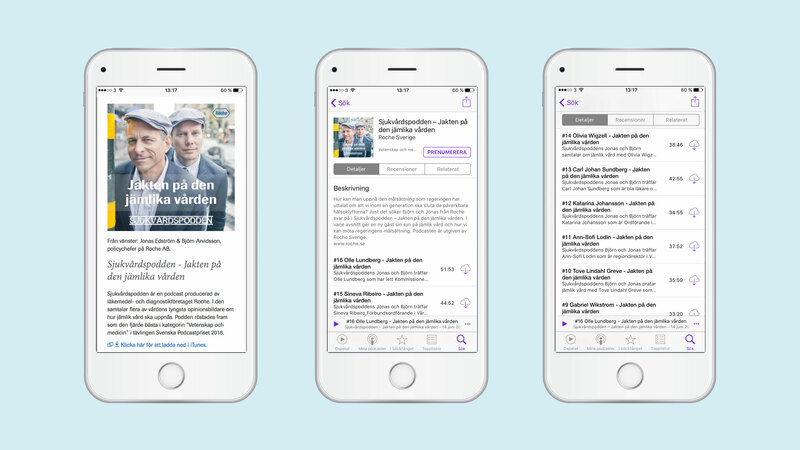 The Pod also came in fourth place in its category when the Swedish Podcast Awards were presented in 2016.